Tantric thangka Much of Tibetan art is oriented towards Buddha, gods and merit. Many works have complex iconography and symbolism that requires extensive knowledge about Tibetan Buddhism to unravel. Influences come from the Pala kingdom in India, the Newari kingdom in Nepal, Kashmir in India, Khotan in Xinjiang, and China. Much of Tibet’s great art was either destroyed by Communists, particularly in the Cultural Revolution, or taken out of Tibet and sold in art shops and auctions and now is in the hands of collectors. Tibetan are is increasingly being sought after by collectors. Art auctions sponsored by Christie’s and Sotheby’s often feature art that was looted or was confiscated during the Cultural Revolution. The most well-known contemporary Tibetan artist is Kalsang Lodrie Oshoe. Tibetan lamaseries contain thousands of frescoes and statues of Buddha and Buddhist gods such as the eleven-headed Avalokitesvara, the Buddhist god mercy. Many of the frescoes depict episodes from Buddha's life, whose aim in part is to educate the illiterate the same way painting of Christ and the saints in European Christian churches aims to do. 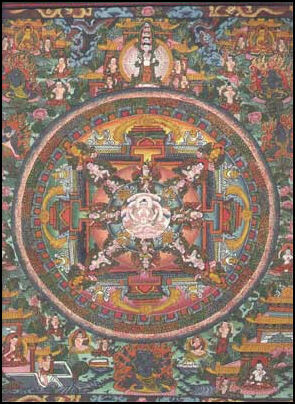 Tibetan frescoe, 1000 Buddhas In Tibetan art the emphasis is placed on the "sacred process" and devotional aspects of the work rather than the aesthetic qualities and originality of the finished product as is often the case with Western art. Most works are done anonymously. Personal expression and the selling of Tibetan art is frowned upon. Tibetan art is expected to be a tool for enlightenment rather an expression of the self. John Listopadm an expert on Tibetan art told the Los Angeles Times, "Tibetan art is psychological art and meditational. It is an art which works on people and their personalities. It can calm you down and help you find peace and balance." Many works of Tibetan Buddhist art are connected with Tantric rituals and are regarded as tools for mediation and worship. Some art objects can he touched, owned, held and moved. Others are meant to be meditated on. These incorporate a “Circle of Bliss,” a sharing of power between the observer and the work of art. 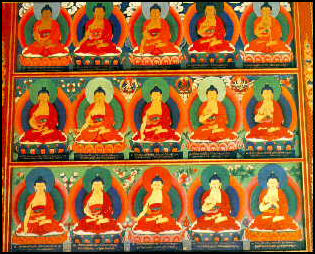 Most Tibetan painting is in the form of murals and frescoes painted on monastery walls. They depict bodhisattvas, scenes from the life of Buddha, Tibetan gods, portraits of famous lamas, asparas (angels) and demonlike dharmpalas stomping on human bodies. Many are intended to be used as meditation aids. Tibetan painting has been influenced by art from China, Central Asia and Nepal but is regarded as closest to the original Buddhist art that evolved in India but is now all but lost. The composition of paintings is often the same: a central image of Buddha, surrounded by smaller, lesser deities. Above the central figure is a supreme Buddha from which the central figure emanated. Some of the best frescoes are seen outside of Tibet in places like Mustang in Nepal and Ladakh in India. Many frescoes in Tibet were either lost or badly damaged in the Cultural Revolution. In recent decades, people found a large number of rock paintings in the Gerze, Ge'gyai and Rutog counties. Some of them are found in higher elevations in western and northern Tibet. They consist mainly of deep and shallow lines carved on stones with harder rocks or other hard objects. Some images have been painted in rich colors. The most beautiful rock paintings in about a dozen places in the Rutog County. Among them, those in the Risum Rimodong and Lorinaka are both large in size and great in number. Their artistic value is important but as of is not completely understood and is not even really known how old they are although they are believed to be very ancient. In ancient times, Tibetan people used the stone inscriptions to describe and record their way of life. The content of the Rutog rock paintings are very rich, including images of hunting, religious rituals, riding, domestic animal herding and farming, and objects like the sun and moon, mountains, yaks, horses, sheep, donkeys, antelopes, houses and human figures. The capital of the ancient Xiangxiong Kingdom was also in the Ngari. Xiangxiong writing is a special form of writing created by the ancestors of the Tibetan ethnic group. This kind of writing is significant as it appeared before Tibetan writing. Thus, the rock paintings here are very important to study the history, culture and early human life in Ngari, as well as the whole region of Tibet. Tibetan murals contain rich content, involving religion, politics, history, economy, culture, Tibetan medicine, and social life. Any of the Buddhist scriptures, Buddhist messages, fairy tales, history stories, daily living scenes, mountains and rivers, birds and flowers, patterns and adornment can be adopted into a wall painting, which has a unique style. It uses cold and dark colors, such as black, dark blue, mauve, dark grey, brown and white; drawing with lines, especially plain lines; simple, rough and sparse outlines. It has the same style of art as the atmosphere of the monastery, and contains exaggerated and distorted art images. Brightly colored wall paintings can be found everywhere in Tibetan monasteries. Some of them are more than 1300 years old. As it is recorded in Tibetan history, in the year when Songtsen Gampo, the Tibetan king, inherited the throne, it is said he saw Sakyamuni, Horse-necked Diamond King, Tara, Stationary Vajrapani, and the four Buddhas. He told the Nepali artisan, Ciba, to carve the four Buddhas into a rock wall and paint them. This is the earliest wall painting and sculpture. Tibetan mural experienced two periods. The first period starts after Songtsen Gampo became the king. Because he married a Khridzun princess of Nepal, and a Wenchen princess of the Tang Dynasty who brought Buddhist statues and Buddhist scriptures, he built Jokhang Monastery and Romoche Monastery, which affected the development of wall painting. The figures in the wall paintings of that period are chubby, and painted with simple color, which is close to the art works at Dunhuang by Bei Wei and the beginning of the Tang Dynasty. The second period started around 10 century A.C. when the initiator of the Yellow sect, Zongkapa, reformed the religion. Yellow sects grew rapidly as the predominant religion. The number of yellow sect monasteries increased to 3000. During that period, the political and religious leaders collected many folk painters to complete wall painting jobs, and let them run in the families. That is the most splendid period of wall painting. The painters gave human life to the statue of Buddha through art, which make the statue look faithful, handsome, merciful, charming, fiery and forthright. Such works exist as picture-story book in all the monasteries. Each of these images has distinct features that can be easily recognized by someone who knows a little bit of Tibetan culture. In addition to the murals of religious figures, there are also some that focus on religious activities, such as debating sutras, Changmo Dance, the Buddhist cosmologic mandalas , and other Buddhist morality tales. In certain temples, chains of pictures illustrate Tibetan legends or follow the lives of religious figures like Sakyamuni, the founder of Buddhism. One of the most famous legends about the Tibetan ancestors - a monkey and a Raksasi - is told in the murals of Potala Palace and Norbulingka. 2) Historical Murals: Based on the history of Tibet, these murals depict key historical figures and events. There are paintings of ancient Tibetan kings, like Songtsen Gampo (617-650), Trisong Detsen (742-798) and Tri Ralpa Chen (866-896) of Tubo Kingdom, as well as their famous concubines, Princess Wencheng and Princess Jincheng of Tang Dynasty (618-907) and Princess Bhrikuti of Nepal. Their stories are told through the series of pictures in Potala, Jokhang and Norbulingka. In Potala, there are also chains of pictures about the biography of the 5th Dalai Lama , who had done much to facilitate the friendship of Tibet and the Chinese central government. Two other historical murals of note: in Ruins of Guge Kingdom there are a series of murals about the rise and down of Tubo Kingdom; and an impressive mural in Norbulingka provides a brief illustration of the entire Tibetan history, from the origination of Tibetans to the 14th Dalai Lama's meeting with Chairman Mao. 3) Social Murals: Some murals are neither religious nor historical, but rather feature the social life of Tibetans. For example, in Jokhang Temple , there is a group of jubilation murals that shows people singing, dancing, playing musical instruments and engaging in sporting matches. In Potala and Samye Monastery , murals of folk sport activities and acrobatics can also be seen. In addition, many large palaces or temples in Tibet feature murals that describe their entire architectural design and construction process. These murals can be found in Potala, Jokhang, Samye Temple, Sakya Monastery and other famous buildings in Tibet. Whether religious, historical or social, all of the murals are elaborate and detailed pieces created by expert artists. In some cases, strict guidelines define the correct way that a key figure should be depicted, so the artist must use his artistic talents to impart subtle differences that make the mural unique from others that feature the same figure. Colors must be applied properly to make sure the murals do not fade excessively over time. Donggar, located in Zhada County, is a small village with only a dozen households. It is about 40 kilometers northwest of the ruins of the Guge Kingdom. Many important archeological discoveries have been made. Two grottos—one discovered on the cliff near the Donggar village, and the other near neighboring Piyang Village—are the largest known Buddhist caves in Tibet. Donggar frescos are housed in three caves. The caves are located half way up the mountain. Since no records are left, much about them remains a cultural mystery. The craftsmanship is of a high quality. They were well knitted with smooth, easy lines, using bright colors and unique designs. The contents include exotic figures, patterns and designs. They are in amazingly good condition: almost a good as those in Mogao Caves in Dunhuang. People think the special mineral-based paints is one of the secrets to their longevity. Figures of Buddha are the main images of the frescos. 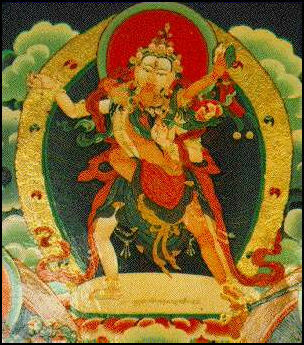 There are also images of Bodhisattvas, protectors of Dharma, and men with unnatural strength. The frescos also depict legendary stories about Buddhism. We can also find pictures expounding on Buddhist texts, and pictures of people worshipping Buddha. Other images include various decorations like peacocks, dragon fish, twin dragons, two phoenixes standing opposite each other, and the Tantric Mandala. There are foreign animals in the frescos, like the dragon, phoenix, lion, horse, sheep, cattle, wild goose, duck and elephant. The most common images are apsaras—heavenly girls—a sign of Indian influence. The universe described in the Donggar frescos is both colorful and figurative. Preliminary investigation indicates different types of cave groups. There are caves for worshipping Buddha, caves for monks and caves for the storage of sundry objects. In the caves for worshipping Buddha we can find the most exquisite and marvelous frescos. In order to protect these precious frescos, public are not allowed to get close to the frescos. The aesthetic effect of Guge Frescos is close to that of the much older Mogao cave frescos Dunhuang: sublimity mixed with elegance, symmetry with harmony, femininity with masculinity, melancholy with heroism, and religiosity with romanticism. Compared with Donggar frescos that use direct colour stipples and batik-style painting (disambiguation), Guge frescos present a delicacy of brush strokes and a beauty of black ink framing that is more akin to traditional Chinese painting. “Was it right or wrong to buy it? Some will argue that it is better for the piece to be silently admired by a collector respectful of Buddhist art than to go on knocking about the market and risking further damage. Others may stay away from a fragment blighted by destructive fury, wherever it was unleashed. This is a moral dilemma to be resolved by each one of us according to our convictions. Cynics will add that at that price the risk involved was minimal. But there were quite a few failures of low-priced works as well as of expensive ones. In a market starved for goods, where some are prepared to pay the earth, this may mean that a new approach to the debris of destroyed monuments and archaeological sites across Asia is looming.